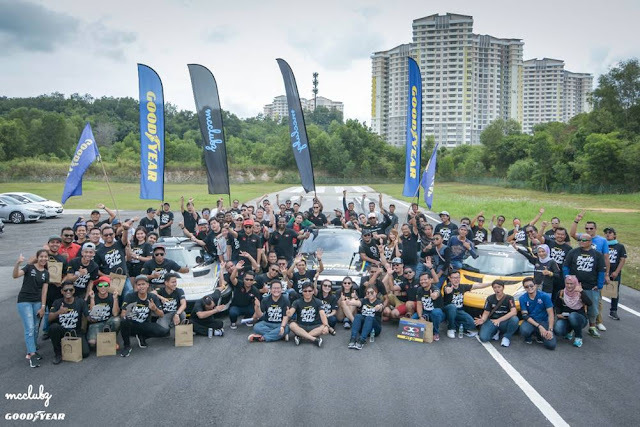 The Battle of The Clubs 2017 organized by Goodyear Malaysia is an exclusive monthly community gathering of avid car junkies from eight selected car clubs in Malaysia, featuring a series of fun team challenges. Having just recently concluded the “Time Attack” challenge, participants are currently gearing up for the next challenge called “On The Road Treasure Hunt” across Klang Valley happening this coming Sunday, 17 December 2017. The participating car clubs are VW Club Malaysia, Satria Society, Myvi Movement, Peugeot Club Malaysia, Benzer Motorsports Malaysia, Club Audi Malaysia, The Rusted Jackets, and Civic X Community. The on-going meet-up across hotspots in Selangor, over the span of four months, has since received high engagement by the respective club members and their supporters, with the sponsor anticipating to award The Best Car Club 2017 early next year during its finale. The competition, which is based on a points system, consists of six different team challenges in total. The car junkies are tested on their skills, knowledge, creativity, teamwork, and passion for their cars. The participants collectively enjoyed the “Time Attack Challenge” round the most so far. The round four entailed driving the Lotus Evora 400S cars fitted with the latest Goodyear UHP tire – Eagle F1 Asymmetric 3. Five drivers representing each team were put into an exciting challenge to complete a course which includes slalom tests, 360º turn, a sprint back to the ending grid, and the ending with a wet braking test. Each club member’s time was tracked and added to the total team time where the club with the shortest total time wins the challenge. It was an exhilarating experience wrapped up in high spirits. This challenge has also gained numerous positive feedback on the Eagle F1 Asymmetric 3. The UHP tire’s superior dry and wet grip, braking and handling performance impressed the drivers. One for the album: Members and supporters of the Battle of The Car Clubs 2017 posing with the Lotus Evora 400S cars fitted with the latest Goodyear UHP tire – Eagle F1 Asymmetric 3 during the “Time Attack Challenge” weekend held at Putrajaya Recreational Airfield. The campaign started in early August 2017 with the Go-Kart Endurance Race challenge, followed by the Paintball Challenge, the Livery Design Challenge and the recent Time Attack Challenge. With VW Club Malaysia leading on the scoreboard, the other contenders will attempt to catch up with the upcoming On The Road Treasure Hunt challenge this weekend and a final showdown which will be a public event, as Goodyear Malaysia crowns The Best Car Club of 2017.